Gemaakt in een speciale geanodiseerde, hygiënische en anticorrosieve aluminiumlegering. Professionele snijmachine met ring, sleevergrendeling en mesverwijdervoorziening. Geventileerde motor met hoog vermogen. Decimale regeling van de snijdikte. 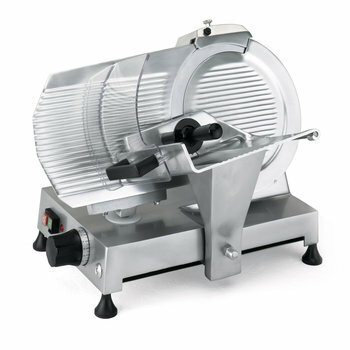 Sammic GC belt driven deli slicers are made of special anodized, anticorrosive and hygienic aluminium alloy. All models are equipped with an easy to use built-in sharpener. The cuttingthickness can be adjusted, guaranteeing a precise cut. They are very easy to clean. 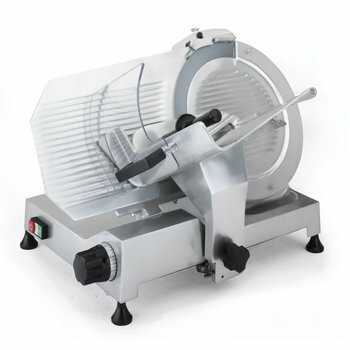 Sammic GCP professional slicers are equipped with ring, carriage lock and blade removal tool. Their heavy duty, ventilated motor guarantees commercial perfornance. The carriage is mounted on life-lubricated bearings.